I am ashamed to say that I neglected to inform our readers of a momentous event that happened this past Tuesday. 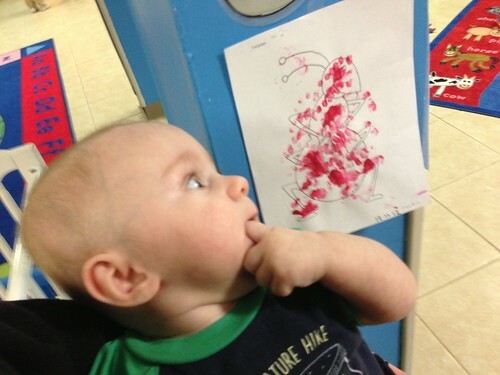 When I picked up the Wombats from day care Martin had participated in his first artistic endeavor. Sure it seems weird to celebrate this seemingly involuntary art project but Martin seemed quite proud of it. Also, the people at day care were careful to tell me not to be alarmed if his feet were a little red. 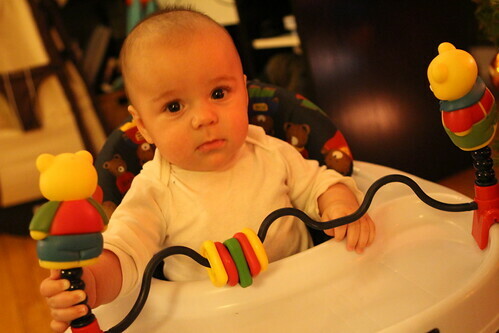 Today Elliott tried his hand (i.e. foot) at painting and made a pretty boss snowman. I mean look at it! The kid's got some skills. 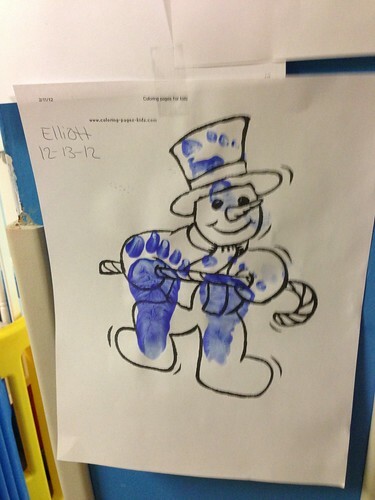 Admittedly the colors was a strange choice but his snowman sketch was spot on. 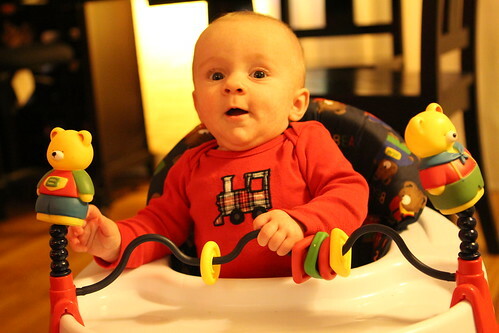 And he's not even six months old! Upon getting home I put the guys in their walkers and attached the weird toy attachments to their walkers that Jen had deemed "seizure-inducing." I thought maybe it would distract them for a moment while I prepared to put them to bed. Martin was entertained for about four minutes. Elliott lasted about six minutes. 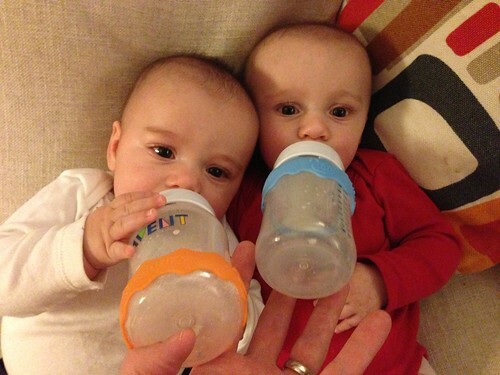 They were super tired, the kind of tired where it's sort of unclear whether they're tired or hungry. I fed both of them with my patented dual feeding skillz then gave them their rice cereal, washed their grubby hands and faces, then put them to sleep. Then Martin lost his mind and I had to feed him again and put him to sleep. Luckily I had a few moments between coming home and picking them up to start up this soup. 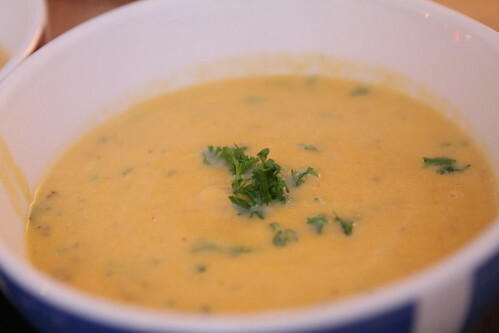 I attempted to recreate the sweet potato clam chowder that we had on Monday at The Ginger Man. I used the same basic technique that I use for my normal clam chowder with a few variations. I rendered the bacon, removed it from the pan, tossed in some butter, onions and celery, then added the sweet potato, added the clam juice, cooked it down, pureed it, added skim milk and heavy cream. Then I tossed the bacon back in, added some chopped parsley, and some chopped clams before serving. The result was quite good. It was a bit lighter than The Ginger Man's version probably because I used skim milk as opposed to 100% cream with additional butter that they used. However, I think I would gladly make this version again. I'm very glad I stumbled upon their take on clam chowder. 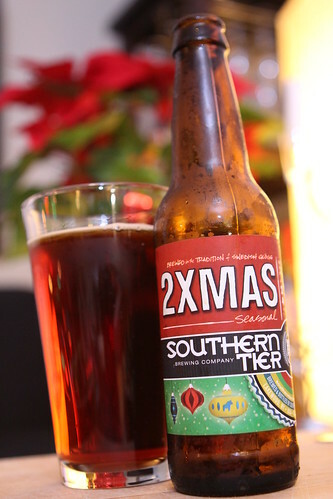 For beer I poured this 2XMAS from Southern Tier Brewing Company. It went with the soup far better than I would have imagined. It was fairly malty which works well with cream. The fig, orange, and spices were probably not the best accompaniments but the overall package was pleasing. After dinner it was time to watch National Lampoon's Christmas Vacation, drink a little eggnog (though, sadly not out of a moose-shaped mug), and pretend not to fall asleep fifteen minutes into the movie.